Any ideas for terrible patio? We have concrete around the pool which is in good shape however it's very plain. We also have concrete patio along the front of the house which had (by previous owners) been topped with patio tile and is a horrible mess, cracking and falling off. It looks like it will be easy to take off as it is falling off anyway. So I'm just wondering what the best idea would be to make it all look nice. I have considered concrete stenciling. The kind which uses stencils and then a thin layer of concrete like substance is applied then sealed. Would concrete stamping even be an option or is it just for newly poured concrete? And if it is what about the edges of the pool being flush with the concrete. Also thought about patio brick around the front patio , but I don't know much about how they weather. Price is an issue but something has to be done. I hate the wayeverything looks as it is. A thin layer of concrete poured on top of the current patio may not hold up very well and be prone to cracking. You could try some of the epoxy paints for garage floors and see if there is something you like there. You might investigate putting pavers down over the concrete as well. You might investigate putting pavers down over the concrete as well. I've seen it done and honestly it looks horrible and wont hold up. If your going to do pavers, just rip out the concrete. In my travels, once a walk or patio starts to go, nothing will fix it correctly or look right except a new one. And it's in great condition, just plain. The other is in good condition once the patio tile is removed. Just plain ugly concrete. I misunderstood. I thought the patio was in bad shape. Your just saying it's ugly? Why dont you just take it out and do something that looks better? You can ave new, colored stamped concrete done for 6-7 bucks a sq ft, give or take. They make 1" pavers which are meant for putting down on concrete. Our Flamingo room was a concrete patio which extended some outside it. We incorporated the 1 inch to match the regular pavers to keep the same pattern. Look at our pool build in the sig bar. Thanks for the replies. I probably wasn't real clear. The one patio is a mess because the tile is cracking and falling off. The actualt concreteis in good shape everywhere. 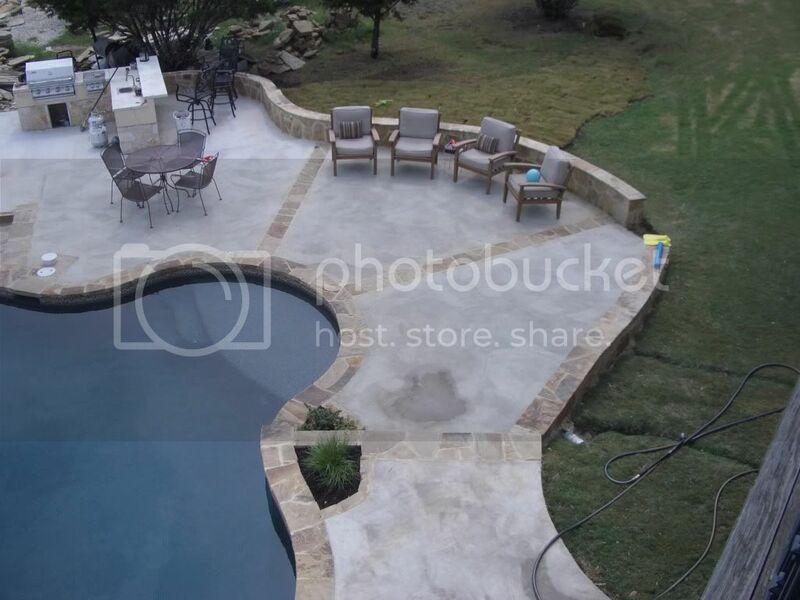 I would love to do the stamped concrete but not sure you can take concret up from around the pool, and I have a very large area of concrete all around the pool so that would be quite costly. And as for pavers I love that idea but it seem controversial on this site as to whether they do good on concrete and in geographical areas that freeze. It definitely freezes here. Is there a way to do the pavers around the pool when the concrete is already flush with the pool? What about staining? Your pool area is beautiful by the way! I love the color of thise pavers. That would actually be the exactcolors I would need to go with. Good questions about freezing. You will have to look into it. I do not see where you are from, you might want to edit your profile and put out a question asking for info for pavers in a freezing location. I am from VA. I will edit my sig. I have looked into the staining od concrete. Of course the pictues are beautiful, but I would love to hear from someone who has done it to see if it's really that great. The acid staining looks beautiful. Maybe I'll start a thread to see if anyone has pics or advice on that. I vote for acid stain! My cousin does it for a living...it changes the whole look of the area! Something you might consider is chipping out 6" on either side of any expansion joints (or adding some new ones) and then installing stone or pavers into that expansion joint where you have chipped it out. We were planning on staining the concrete, but we'll likely hold off as we're very happy with the look of the natural concrete with the stone coping, walls and expansion joints. Our PB made this suggestion and it came off really nice. Breaks up the large expanses of concrete. Visit this link www.elitecrete.com I think you will find your answer there.